In the riverside neighbourhood of Podil, in downtown Kyiv, the mighty hall of the Rye Market looms over the busy traffic. 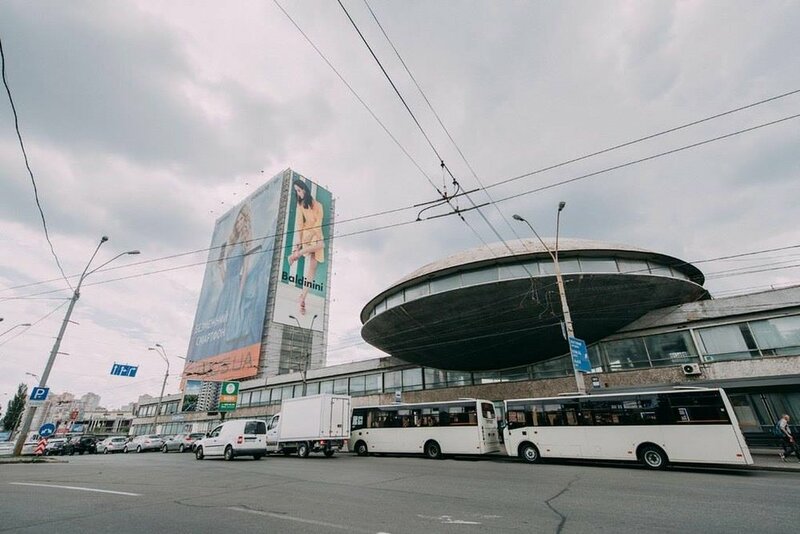 Lovers of futuristic Soviet architecture will awe at its giant curved roof, the geometric decorations on its towering glass walls and its full metal bas-reliefs, depicting the ancient history of Kyiv as well as the industrial achievements of the Soviet Union. But the iron-clad scenes from the past might soon be history, now that the city of Kyiv is planning a large-scale redesigning of the market that was built in 1980. In the context of Ukraine’s decommunisation politics, the communist decorations are to be replaced with something, well, less communist. There is no place for Soviet nostalgia in today’s Kyiv. Granted, the Rye Market has withered over time. The 37 years that have passed since its construction have covered its façade in a grimy layer of city dirt. Its hall has turned into a muddle of market stalls, counters, kiosks, banners and DIY decorations that might be true to the spirit of the bazar, but are unworthy of the Rye Market’s grand architecture. Last year, Kyiv’s officials finally decided on a large-scale renovation. Outlines for the new Rye Market surfaced on social media last year, showing a massive cleanup of the market hall, isolation works and installation of a new heating system (which will be welcomed by the venders). But the city administration wouldn’t stop at that: also featuring in the plans was a total re-envisioning of the market’s exterior, stripping it of its bold futurist decorations and replacing them by a frizzy flower pattern, inspired by traditional Ukrainian motives. The quarrel over the Rye Market is not an isolated incident. In fact, it reveals a nation-wide schism in the way Ukraine experiences its own past. Since Euromaidan and the Russian occupation of Crimea, Ukraine has been deleting its Soviet past. In 2015, a series of decommunisation laws were passed to formalise the erasure of all traces dating back to the USSR. These included removing communist symbols (Lenin statues, hammer and sickles, etc. ), replacing thousands of inscriptions on war monuments and renaming a grand total of 9000 city and street names. To replace the communist imagery, the Ukrainians have been drawing inspiration from the country’s pre-Soviet past: the Ukraine of simple but honest village folk. These images were already popular in Ukraine before, but have boomed since Euromaidan. Cossacks and vyshyvankas (the national costume with embroidered chest and sleeves) have become widespread in popular culture. Traditional motifs decorate buildings, hoodies, agendas, cars, socks and even toilet paper. There is a (partly subconscious) subtext to this. The ideal of rural Ukraine that is recreated is obviously a pre-Soviet, pre-Russian Ukraine. It is the unspoiled, good-hearted Ukraine, before it was invaded by northern barbarians. The Ukraine of freedom-loving Cossacks and deeply rooted democratic principles that supposedly set it apart from the ‘Russian world’. But as the controversy over the Rye Market shows, there is also a part of society that does not want to dispose of the Soviet past so readily. This tendency comes in two flavours: first, there are the real Soviet nostalgics—those who think the downfall of the Soviet empire was a shame and the Ukrainian state should never have been created. It is this kind of nostalgia that served as the foundation for the breakaway Donetsk and Luhansk People’s Republics in eastern Ukraine. But there exists a non-ideological flavour as well – mostly big-city hipsters who have a keen eye for the unloving beauty of futuristic Soviet architecture. These people, while rejecting the political reality of the Soviet past, do not wish to dispose of its aesthetics. 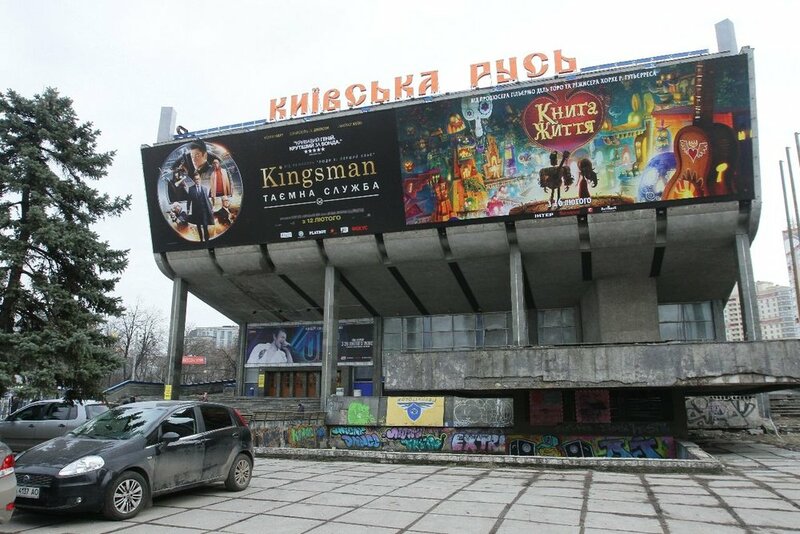 One of these people is architect Dana Kosmina, who published a calendar called ‘Bright Kyiv’ last year, depicting some of the city’s breath-taking futurist pearls (the Salute Hotel, movie theatre ‘Kyivan Rus’), before and after they were ruined by demolition, paint-jobs or ugly new high-rise. Another one is photographer Yevgen Nikiforov, who earlier this year published a book containing around 200 pictures of Soviet mosaics from around Ukraine. The title, ‘Decommunized: Ukrainian Soviet Mosaics’ is purposefully ambiguous: he is in fact breaking the mosaics out of their ideological shell by presenting them as artworks. Since the book was published, many of the mosaics Nikiforov photographed have been decommunised in the sense of Ukrainian law, i.e. demolished. What we see in Ukraine is a competition between two nostalgic regimes: idyllic nostalgia vs. Soviet nostalgia, in which the former is supported by most people and has the official approval of the government. Meanwhile, Soviet nostalgics are being sidelined from public debates and accused of harbouring ‘anti-Ukrainian sentiments’. This ignores the fact that many of them are not big fans of communism either: they simply appreciate some of the era’s architectural achievements and consider these to be part of Ukraine’s cultural heritage. "By embracing the pre-communist past, they are kicking against the more recent communist past; by revaluing their traditions, they are being progressive." Idyllic pre-modern nostalgia is not unique to Ukraine. Think of the German Heimat obsession, the mythologized "France profonde" or the cult of the rolling green hills of England. What makes Ukraine’s village idyll stand out, however, is it omnipresence, pervading everyday life and popular culture on a massive scale. Another unique trait is that Ukrainians link their rural yore to modernity and progress. By embracing the pre-communist past, they are kicking against the more recent communist past; by revaluing their traditions, they are being progressive. Wearing a vyshyvanka can make you traditional and modern at the same time. It’s interesting to compare this interpretation of the past to Russia. Under the Putin administration the pre-Soviet Russia of tsars and balalaikas has become a staple of popular culture. At the same time, the Kremlin has endorsed a re-appreciation of the Soviet past, focusing on its achievements and downplaying its horrors. Even if the original communists were trying to break with the tsarist past, today’s regime is forging together both episodes of history. Where Ukrainians have fractured their historical experience, setting apart the communist era as an abnormal deviation from the country’s natural development, the Russians are synthesising their past into one great continuous story. Those Ukrainians who love Soviet architecture position themselves outside of this comparison. By focusing on aesthetics instead of politics, they take the ideological sting out of history. But at a time when the future of the Ukrainian state is in danger, everything becomes political, and there is little room for such nuance. Back to the Rye Market in Kyiv. Last June a small group of students organised a demonstration against the renovation plans outside the market hall. They carried posters, displaying old photographs and blueprints of the building. The city administration reacted by denying it had approved the blueprint with the traditional flower patterns. “Neither I, nor the director of the market know anything about the visualisation of the architectural project that appeared on social media,” an official stated. “Someone has made something up on paper and put it online.” According to the official, no final plan for the renovation had been drafted (although work had already started). Whether the (professionally made) plans were really fake or the city of Kyiv silently tried to withdraw the plans after the upheaval they caused, we will never know. In any case, it was a small victory for the Soviet aesthetes. The question is whether they will be allowed to enjoy their victory for long. According to the latest news, an open contest will determine the new design for the market’s façade. That this new design will be more true to the original’s crude Soviet futurism is highly doubtful. Would you like to read more of Tobias' work in the future? Donate and support Tobias in writing his next article! Europe is more than the European Union. Ukraine lies right at its border and has always fascinated me. Now that I live here, I hope to show you a side of Europe you have not yet seen."